Note from designer: There is an error row 3 chart E and it does not appear on my list of errata from XRX. I suggest adding a second ‘k2tog’ at the end of row 3 or row 5, rather than in the middle of row 5. The latter would be very noticeable, whereas tucking it in at the end of a row would be more discreet. Small: 3.25mm/US 3 circular needles, or size to obtain gauge, 80-60cm (32-24”); change to shorter needle as stitch number decreases. Large: Small: 3.75mm/US 5 circular needles, or size to obtain gauge, 80-60cm (32-24”); change to shorter needle as stitch number decreases. Begin and end each row of shawl with 2 stockinette stitches. These stitches are not included in charts or stitch counts. Stitch counts in the pattern are given for one section of shawl only. 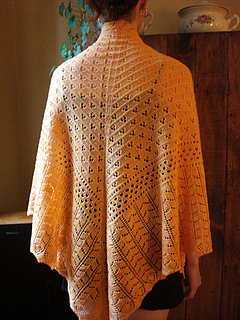 Pattern notes: Two sizes are given for this shawl, using two different needles sizes. The size change is accomplished by varying needles size & gauge. For both sizes, 624 stitches are initially cast on; the pattern then decreases. 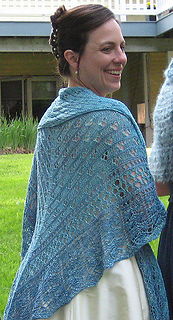 The border is picked up separately along the cast on edge and knit on after the body of the shawl is finished. 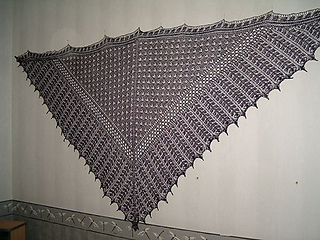 There are seven charts for this shawl. Gauge notes: Gauge should be 24 sts by 34 rows = 4 inches on size 3 needles and 20 sts by 28 rows on size 5 needles. 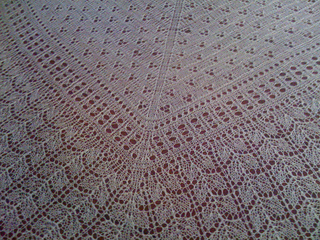 The smaller gauge will result in a shawl of approximately 33 x 68 inches, using 1300 yards of superfine laceweight; the larger gauge will result in a shawl of approximately 40” x 82”, using 2200 yards of yarn. Volunteer Editor’s note: Many knitters have reported running short of yarn on VLT patterns--check gauge carefully (and purchase extra yardage, just to be safe! ).